Note: There is a space between the two dots! Firstly, when run it will check that “Import-Module DataONTAP” is done, and if not will load it or return an error if there is a problem. And then we have the functionality as detailed below! Returns currently connected to controllers/Vservers or NULL if no current connections. An output of commands with a basic description; it also outputs the path to your credentials file. Note: The credentials file is saved/created in the current working directory and is named per user (so if different users use the same management system, they don’t overwrite another user’s credentials file.) Remember, these credentials files are specific to the user logged into the Windows system, different Windows users cannot share the same credentials file! List all credentials in a hash-table with two columns - IP/DNS and user. Removes credentials for the specified IP/DNS, or IP/DNS and USER combination! Connects to the Cluster/Vserver with the specified arguments. If the password is not specified, it looks for the credentials in the credentials file. If password is specified, it will write a new entry in the credentials file only if it connects successfully; and if the same combination of IP/DNS and USER is there, it will update the password. Like the above (without add), only difference is that here it creates an additional connection as specified. Removes the current IP/DNS, or IP/DNS and USER combination from the current connections. 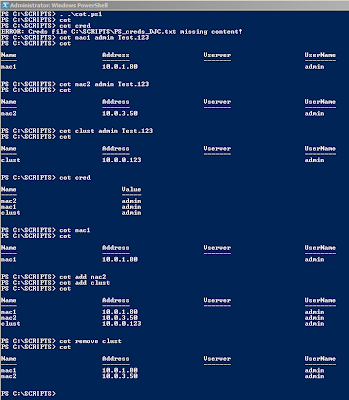 In fact, there is no “-remove” currently implemented in the Data ONTAP PowerShell tool kit for Connect-NcController, only add, so what this actually does is clears all the connections, then re-add all the connections back in bar the one that was marked to be removed. I was starting to think that this might go down as the most pointless script anyone has ever written ever! And my motivation to keep going with it did falter a few times. The finished product might be useful though since all automation scripts require credentials in some way (that’s if not using AD authentication or similar.) 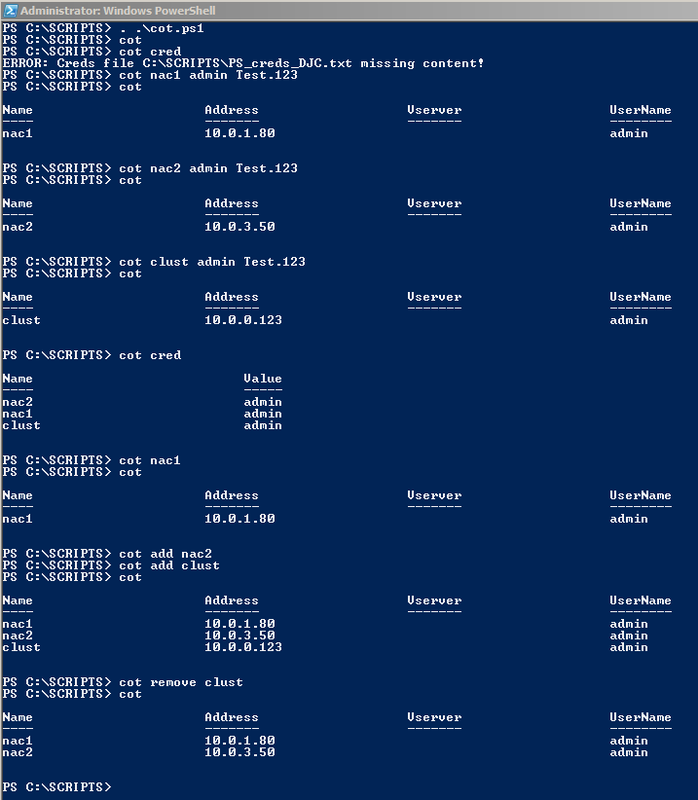 And the process of connecting to controllers is pretty fundamental for any automation script, or even simply for managing your clusters via PowerShell! It’s not been tested as much as I would like, and really no more time to invest in this project at the moment. Apologies if there are any errors or the functionality doesn’t work 100% as stated - please let me know and I will endeavour to fix. Note: In this example I’m using DNS names - it works exactly the same with IP Addresses! Note: The passwords which we’ve given as plain text above are encrypted in the credentials file! Image: cot in action (yes, amazingly it does actually work)!